(Spider-Boy#1(bts)) - The Special Crimes Unit was created as a special division under the New York Police Department. 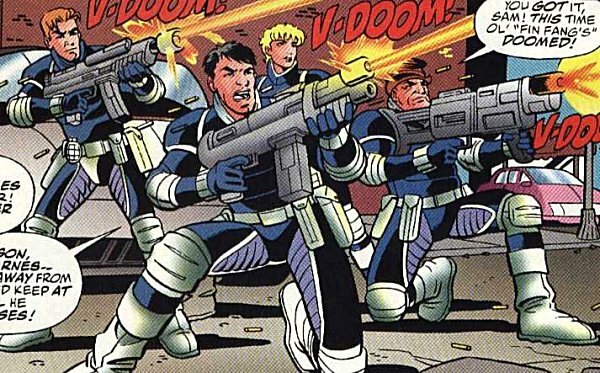 Its mission was presumably to handle unusual disturbances (especially those involving metahumans and super-villains). (Spider-Boy#1) - "Big Trouble!" - As Spider-Boy (Pete Ross) battled the gigantic King Lizard on Kesel Street in New York City, the New York Special Crimes Unit, under the leadership of Captain Sam Makoa, opened fire on King Lizard. 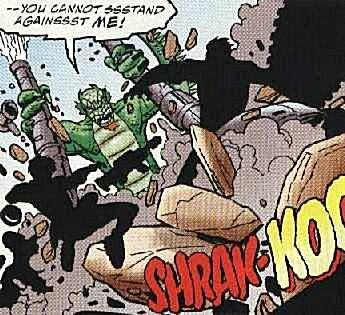 Although they temporarily stunned the monstrous villain, King Lizard retaliated by ripping the pipes out from under the street, causing the New York Special Crimes Unit to come crashing to the ground. Afterward, the Special Crimes Unit was forced to regroup and leave King Lizard for Spider-Boy to handle on his own. 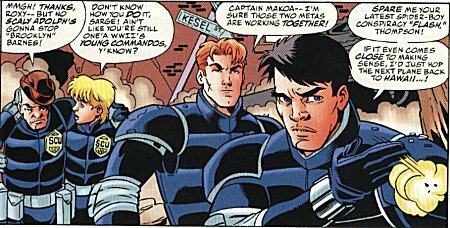 The leader of the New York Special Crimes Unit, Captain Sam Makoa seems to trust Spider-Boy (Pete Ross) and has little patience for "Flash" Thompson's outlandish Spider-Boy conspiracy theories. 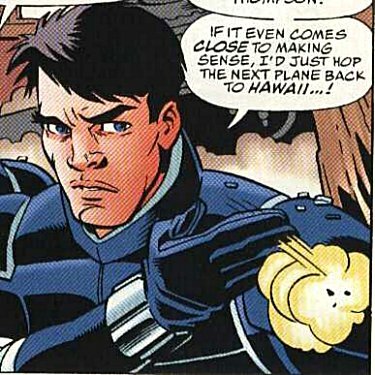 Captain Sam Makoa is an Amalgam Universe version of Sam Makoa of the DC Universe. A member of the New York Special Crimes Unit, "Flash" Thompson dislikes the way-cool Spider-Boy (Pete Ross). In SPIDER-BOY#1, Thompson is convinced that Spider-Boy and the villain King Lizard are working together (although Captain Sam Makoa does not buy Thompson's latest conspiracy theory). 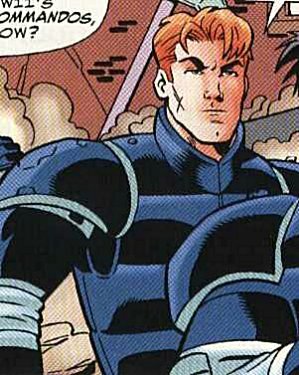 "Flash" Thompson is an Amalgam Universe version of Eugene "Flash" Thompson of the Marvel Universe. The daughter of Spider-Boy's personal manager Rex Leech, Roxy Leech is a member of the New York Special Crimes Unit. She is amazed at how her co-worker "Brooklyn" Barnes keeps up his fighting spirit after so many decades of combating injustice. Roxy Leech is an Amalgam Universe version of Roxy Leech of the DC Universe. • New York Police Department of Earth-616, @ ??? All characters mentioned or pictured are ™ and � 1941-2099 Marvel Characters, Inc or DC Comics. All Rights Reserved. If you like this stuff, you should check out the real thing!